Why would my child need early treatment? Early treatment, or Phase I, would be recommended if there are certain discrepancies in the development of the upper and lower jaws. Early treatment can correct these problems in the early growth phase of your child (utilizing a functional appliance), which develops the bone to a more normal size, to allow enough room for the permanent teeth to erupt. Improved speech from expanding the arches and making more room for the tongue. Reduction of the time in fixed braces and frequently eliminates the need for the extraction of permanent teeth. Prevent the fang look. Upper eye teeth (cuspids) are the last teeth to erupt on the upper arch. If the jaw is too narrow, patient will get the fang look. Prevent possibility of facial asymmetry with the expansion of the upper arch and the correction of the posterior crossbite. What is a functional appliance? Once a thorough and proper diagnosis has been made, the best appliance to be used to correct your child's problems will be selected. A functional appliance is a tiny device designed like a mouth retainer, with micro-screws, to make the appliance able to activate and stimulate the change in bone, therefore making the jaw grow to its potential. The initial records and x-rays, taken at the beginning of treatment, determine growth potential. How long does Phase I treatment last? Phase I treatment usually lasts approximately 10-12 months depending on the severity of the case. The appliance is usually active (making changes to the jaw) for 4-6 months then the appliance should be used as a holding appliance for 6 months or as a retainer to prevent any relapse in the treatment. As the permanent teeth erupt, it will be determined when it is no longer necessary to wear the holding appliance. At what point will my child need orthodontics? Once the early phase of treatment is finished your child will be evaluated on an ongoing basis to monitor the eruption of the permanent teeth. Once the permanent teeth are all present. We will set up a consultation appointment to determine whether there is a need for braces. Usually orthodontics, which means fixed braces, does not begin until the patent has all their permanent teeth (age 11 to 13). While braces are the most popular among younger patients, they can be worn as a teenager or an adult. More adults these days are asking for braces to help improve their smile and appearance. Set up an initial screening appointment for your child today! The area of dentistry called orthodontics involves straightening of teeth with the use of braces. Orthodontics is also indicated when the patient has a bad bite, which can make you feel self conscious and can cause digestive or other health problems. Braces are now less conspicuous and more comfortable than ever before, due to the use of new high performance arch wires, which exert light continuous forces on the teeth. Children should have an orthodontic assessment before the age of five so that early treatment with functional appliances can reduce the time spent wearing braces. The average length of time for orthodontic fixed braces would be 1½ to 2 years when all the permanent teeth have erupted. The treatment time obviously depends on the seriousness of the problem and when treatment is started. Our office recommends that children be evaluated before age five to see if the problem is a bone problem or a tooth problem. If the problem involves the bone, such as the upper or the lower jaw being too narrow or the lower jaw being underdeveloped, then we recommend this problem be treated immediately with functional appliances. The use of functional appliances can reduce the time the child must wear fixed braces and reduce the need for the extraction of permanent teeth. 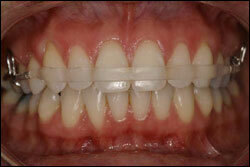 If the problem is merely crooked teeth, many times treatment will be delayed until all the permanent teeth erupt. Most patients today think braces are "cool" because of all the different colours. In fact, there are more that 40 different combinations of coloured elastics, which fit over the braces to keep the wires in place. Every month the patient has their choice of coloured elastics. Most children pick the metal braces, which are much smaller today. Adults and teenagers prefer the clear braces because they blend in with the colour of the teeth and are harder to see. We have some females who prefer gold braces since they look like jewelry. The newest and latest trend is toward invisible braces, where trays that are changed periodically and move the teeth into a better position. For more information on clear braces, click here. A clear retainer will be made to wear when your braces are removed. The roots of the teeth need enough time to settle in the bone, so it's absolutely imperative that you follow the instructions on wearing the retainer to maintain your beautiful smile at the end of treatment. The length of time in retainers varies depending on the amount of tooth movement that was necessary. However, as a general rule of thumb, we recommend full time wear of the upper clear retainer for 1 full year and 1 year at night only. We generally like to make the lower retainer fixed, behind the lower front teeth, and it remains in place for 3-5 years. Exciting news regarding new clear retainers! The newest retainer now has a clear labial bow which makes the retainer practically invisible. Patients love these new clear retainers.